The two winners of the competition bagged an award of a-week-long sponsored study tour to the UK. Aiman Kulsoom Rizvi from Amity Law School and Rangashree TK from the National Law University, Delhi emerged as the winner and the runners up of the GREAT Essay 2016 competition organised by the British High Commission in collaboration with Amity University. In its third edition, the competition is the biggest so far with over 400 participants from across the nation. The trip would be a once in a lifetime opportunity to experience culture, arts, commerce, history and politics of the UK. The aim of this competition and the study tour is to give the winning student a glimpse of society in the UK and to acquaint them with different aspects of multi-cultural Britain. Over 200 essays were short listed for the on the spot essay competition for the semi finals held on 18 January. The grand finale was held at the Amity University campus where the synopsis of the five best essays shortlisted were asked to be read out. The two winners captured the sentiments well and managed to present the synopsis of the Essay in the most effective manner. The GREAT Essay 2016 is one of the first events this year themed around Shakespeare Lives- a campaign of unprecedented global programme of events and activities celebrating William Shakespeare’s work on the occasion of the 400th anniversary of his death. In addition to Shakespeare related topic of the Essay competition, Janki Devi Memorial College presented ‘Shakespeare’s Merry Women’- tableaux of women characters from Shakespeare’s plays drawing attention to the relevance in the 21 Century of the questions raised in the Renaissance context. Amity University presented – ‘Unravelling the lyric in Shakespeare’- a performance based on the bard’s iconic monologues and speeches. They presented a medley of the unforgettable lines from Shakespeare’s plays. 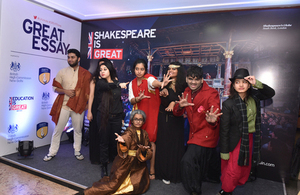 The grand finale of the GREAT Debate competition scheduled for February 2016 will also be themed around Shakespeare Lives. ‘Shakespeare Lives’ is an invitation to the world to join in the celebrations by participating in a unique online collaboration and experiencing the work of Shakespeare directly on stage, through film, exhibitions and in schools. The programme aims to reach over half a billion people around the world.